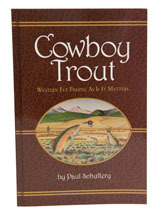 Paul Schullery won’t need any introduction to most of our readers as he is a talented writer who has tackled a wide range of subjects, but one of the drivers behind Cowboy Trout must be that he has lived, worked and fished in Yellowstone Park for much of his life and the history of the West is written across that land. Europeans might question why there is a need for a book like this, but apart from the sheer entertainment some of the stories provide, fly fishing is part of the culture of the West in almost the same way as that malt whisky and salmon fishing are part of the culture of Speyside. Paul’s book chronicles the history of fly fishing in the West from the early exploitation – which was still going on as late as the early 1880’s, when no less an angler than Edward Hewitt killed between twelve and fifteen hundred pounds of trout in two days on the Snake – to the present day. The pioneering spirit might live on, but as Cowboy Trout makes abundantly clear, even an ecosystem the size of the American West can’t withstand the onslaught of human nature. Sobering stuff.